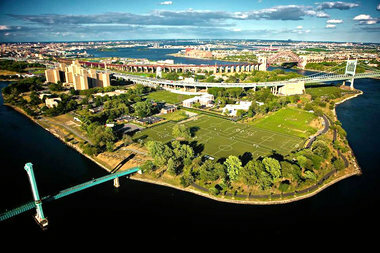 Most of the thefts on Randall's Island have happened at the south end near the homeless shelters, according to the NYPD. RANDALL’S ISLAND — Opportunistic thieves have been targeting people playing sports on Randall’s Island this summer, taking their backpacks phones and wallets, police said. So far this year, there have been 24 grand larceny reports compared to last year’s 23 during the same time period. Most of them have happened in the last month and a half, according to NYPD data. “We were doing well into June and mid July even,” said Deputy Inspector Thomas Harnisch. Last Sunday, a 32-year-old playing football at 10:30 a.m. man lost his $700 smart phone, $36 in cash, his credit card and a MetroCard. Later that day, around 4 p.m., a 30-year-old woman lost her phone, charger, a bottle of perfume, her flip-flops and bag. To reverse the trend, the NYPD and Randall’s Island Park Alliance have been increasing awareness about the issue by telling people to be more vigilant. “I think it’s just about keeping your stuff close by and in eyesight,” said Deborah Maher of the Randall’s Island Park Alliance. Most of the thefts are coming from fields in the south side of the island, near a couple of homeless shelters. Officers have arrested residents of the shelters for theft in the last few years, Harnisch said. People should designate a trusted coach, parent or team official to collect all valuables from players before the game and put them in a backpack to keep on his or her person at all times, he advised. To increase awareness, crime prevention officers distribute about 200 fliers telling people to keep an eye on their belonging on weekends. Plain-clothes officers also walk around the fields to make sure everything is safe. In April, when the Randall’s Island Park Alliance held a meeting with everyone who received a permit to use the fields, police officers asked them to let their coaches, players and parents know to be on guard, said Maher. “We also have parks officers who go out and patrol the park. They often go to people if they see things are being unattended,” she added.